A great choice for those who want to relax by the beach and also experience a thrilling safari not too far. Kenya’s tropical coastline has some beautiful palm-fringed beaches and time spent relaxing on these beaches makes the perfect end to any safari in Kenya. Besides sunbathing and swimming, most of the beach resorts are perfect for snorkelling, scuba diving, game fishing and spotting marine life such as sea turtles and dolphins. Away from the beach, take a day trip to explore Mombasa’s Old Town, a maze of fascinating narrow alleyways dating back to the 12th century. On the 2-night Safari, stay at the unique Sarova Salt Lick Lodge built on top of stilts overlooking multiple watering holes around the rooms. The spectacular lodge provides 24-hour games viewing opportunities from every corner, with an under-ground viewing room which offers exciting views of the nocturnal animals at night. The lodge has an outdoor swimming pool. Enjoy game drives in the early morning and late afternoon , as well as night drives, accompanied by trained guides. Night game drives will provide thrilling views of predators actively hunting with sightings of spotted and striped hyenas, mongoose, jackals, porcupines, bush babies and the elusive leopard. Enjoy a sumptuous champagne breakfast in the bush against the back-drop of Taita Hills and the Taita Hills Sanctuary plains. A unique experience with live cooking. Enjoy a sundowner in the bush and experience the spectacular sunsets and magnificent views of Mount Kilimanjaro. Take a nature walk with a qualified guide and marvel at the wildlife that is not noticed during a game drive but evident on foot. You will experience the unique flora, fauna and culture of this fascinating ecosystem. Escape to the sparkling white sandy beaches, palm fringed skies and shimmering turquoise seas of Mombasa’s tropical shores. Explore the Old Town, a maze of fascinating narrow alleyways lined with mosques, shops, Arab cafés, souks and historic Swahili houses. Get in touch with nature by visiting the Mamba Village and witness the largest commune of crocodiles in Africa. Climb the ramparts of Fort Jesus, a chunky fortress originally built in the 16th century by Portuguese colonists to guard the harbour entrance. You will be met on arrival and transfer to Voyager Beach Resort. Spend your Mombasa Beach Holiday relaxing on the beautiful beach, soaking up the island spirit. Optional activities are available including sailing, snorkelling or diving amongst the multi coloured coral reefs. Day 7 & Day 8 – Collection from the beach resort & transfer to the Sarova Salt Lick Lodge. Spend 2 Nights on Full Board, inclusive of morning & afternoon game drives. Added Value includes: a Bush Breakfast against the backdrop of Taital Hills with live cooking, a romantic Sundowner with views of Mt Kilimanjaro (weather permitting) and an eductional Nature Walk with a guided ranger. Day 9 – After 2 nights of a thrilling Kenya Safari, you will be transferred back to Mombasa & spend a night at Voyager Beach Resort on All Inclusive. Day 10 – After a magical and relaxing stay in Mombasa, you will be transferred to the Airport in time for your departure flight. Southern Palms Beach Resort is located on the beautiful Diani Beach with its blend of natural beauty and uptown chic on the South Coast of Mombasa. 298 Rooms overlooking the Swimming Pools and Gardens with Private balconies – out of which 36 are Ocean Front Rooms. Inter-connecting rooms are available. 2 Luxury Suites with spacious sitting area. Situated on Diani Beach on the South Coast of Mombasa, the resort is located majestically on top of a coral reef cliff with panoramic views of the tropical gardens and shores of the Indian Ocean. The resort stretches over 500 metres of golden beach front offering the ultimate luxury beach holiday. Distance: 1 hour 15 minutes from the airport inclusive of a short ferry ride. Large inter-connecting rooms are available. 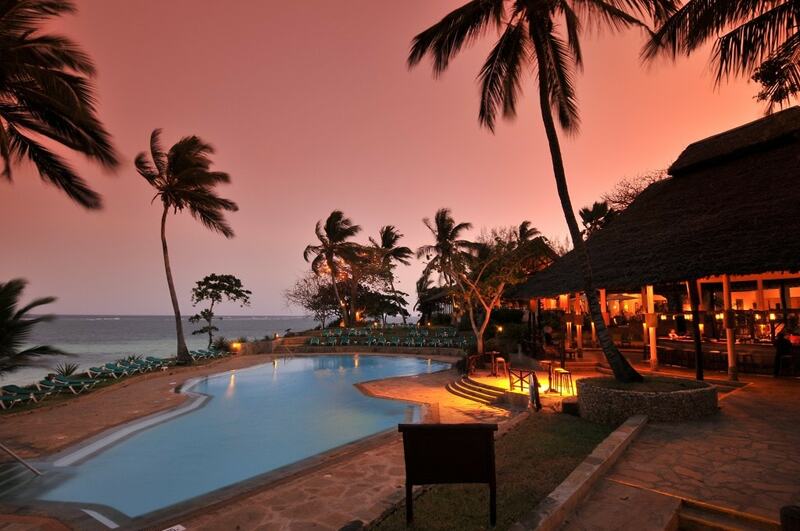 Voyager Beach Resort overlooks the white sands of Nyali beach, just 7km north of Mombasa. The resort’s convenient location gives Voyager guests easy access to a huge variety of historical, sporting and cultural attractions, including Africa’s largest crocodile farm and the world-famous Bamburi Nature Trail. Moi International Airport is 30 km away. Soft drinks, juices, beer, house wine, tea and coffee and selected spirits. Snacks, pizzas and light meals. 83 with beautiful sea views, the remainder overlooking the resort’s lush tropical gardens. Three classic restaurants and a coffee shop. Three bars, including one open 24 hours. Sports pool and beach front relax pool. Fun pool, with jacuzzi, waterfall and kids’ pool. Kenya’s best coastal hotel shopping arcade. Acclaimed salon with parisian hairdressers. Modern health centre with techno gym equipment. Games area, with table tennis, pool and dart boards. Sand volleyball court with daily competitions. This charming hotel lies on Shanzu Beach north of Mombasa with all the timelessness and harmony of an ancient Swahili town. Transfers by road from Mombasa take approximately one hour. A member of the Leading Hotels of the World, it is the only property on Kenya’s coastline accorded this distinction. Village Rooms – located within the winding lanes and shady courts of the traditional Swahili Village is uniquely styled to resemble a historical building from the ancient island town of Lamu. All rooms have private balconies with vistas of the ocean or quiet courtyards with meticulously maintained gardens. An abundant selection of watersports and recreation facilities is available – scuba diving, windsurfing, deep-sea fishing, mini-sailing, coral reef snorkelling, tennis, squash, beach volleyball, and more. Professional instructors are available for lessons. Evening entertainment in the form of bands, discotheques, film shows and traditional dancing is nightly. Guests can dance by a floodlit pool, enjoying exciting African entertainment spectacles. Whether it is dining beneath the stars at Nyota Terrace, a casual but elegant ambience at the dhow-shaped Jahazi Beachside grill with its sand floors, informal snacking at Makuti Bar, or sunset cocktails at the Mashua, the choices are always exceptional.